The #cbusfoodbloggers met up at Tiger + Lily last month for a FEAST. Located in downtown Columbus on Gay Street, Tiger + Lily offers fresh, modern Asian cuisine. During our visit, owners Kirsten and Tom Chang explained their passion for creating healthful meals, which is heavily influenced by Kirsten’s nutrition and dietary education. Kirsten and Tom’s passion for healthful food is apparent in their ingredient choices. For example, they serve only non-GMO rice, use only agave sweetener, and even offer zucchini noodles. The lunch and dinner menu includes salads, bone broth, ramen, and entrees, with loads of vegetarian and vegan options. Naturally, there are a few indulgent offerings on the menu too, like the loaded waffled fries topped with Korean BBQ. During the week, they offer nightly specials. Treasure Prawns are the Tuesday night special. They are Japanese style whole shrimp, coated in a special blend of house togarashi mix seasoning and Himalayan pink salt, fried until extra crispy. They are served with mixed greens, scallions, Yumyum sauce, and seasoned white rice. On Wednesdays, Tiger + Lily offers a Chef’s Special, which must be ordered 24 hours in advance. The specials rotate seasonally, but currently include Xian Cold Noodle, Asian Seafood Mala Pot, Thai Steak Strip, Super Bowl Chicken Noodle. Pictured below is the DanDan Mazemen noodle dish, which comes with your choice of Turkey or Tofu. The DanDan noodles are thick-cut and tossed with a tahini-based sauce, chili oil, nori, and Szechuan peppercorn. During our visit, I also tried the tofu lettuce wraps. The lettuce cups come with grilled Tofu squares, kimchi, pickled carrots, pickled cabbage, cilantro, sesame seed, cucumber and side of YumYum sauce. Despite being one of the lightest options on the menu, the dish was very flavorful and juicy. It will be hard to NOT order this every time I visit Tiger + Lily!! The brunch menu is available on Sundays, and includes eggs with pork belly, congee, and Japanese Omurice, which is a dish of fried rice topped with an egg omelette blanket and house special sauce. In my opinion, the standout brunch dish is the Bing. 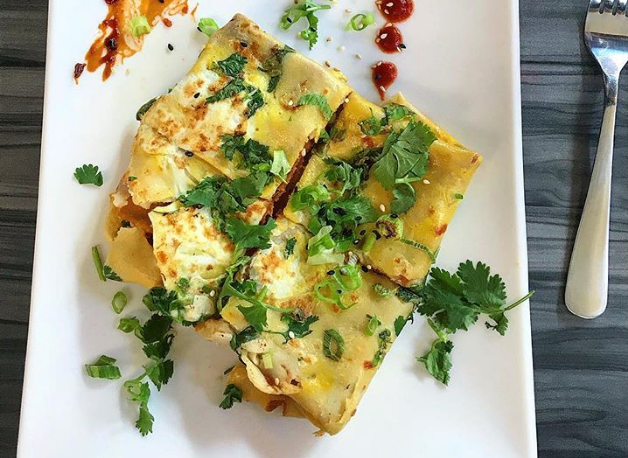 Jianbing is a traditional Chinese street-food breakfast, composed of a crispy soy flour crepe folded with eggs, sesame seed, scallion, cilantro, sweet savory soy paste, Chinese crisps, and chili paste. The brunch menu also features Hong Kong Egg Waffles, with the signature bubble shape. The batter is made from scratch, and toppings vary seasonally. Some of our favorites were the original and the chocolate with oreos! The dessert menu features layer crepe cakes with 15-18 layers of crepes each. Rotating flavors include Matcha, Lychee Rose Petal, Dark Chocolate Oreo, Strawberry Yogurt, Strawberry and Banana. In addition to crepes, the snow bowls are a fun dessert! The jumbo-sized bowls have fresh chunks of fruit, ice cream, and a variety of toppings from sweet red beans to mochi. Each is topped with a drizzle of condensed milk.